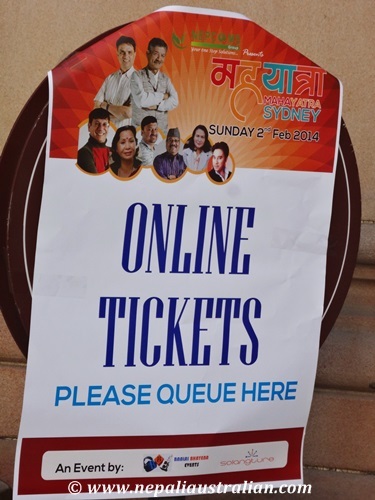 When there was an announcement that MaHa, the comedy duo of Nepal, Madan Krishna Shrestha and Hari Bansha Acharya are coming to Sydney with their show, both me and AS got very excited. For those who have no idea who they are, the duo represents the pinnacle of comedy in Nepal. Their style is focused on creating awareness through laughter. They have also been involved in creating social activities and political freedom movements. They have created lots of teleserials (some of the best) and various patriotic movies which are among the greatest hits in Nepalese TV and Movie industry. 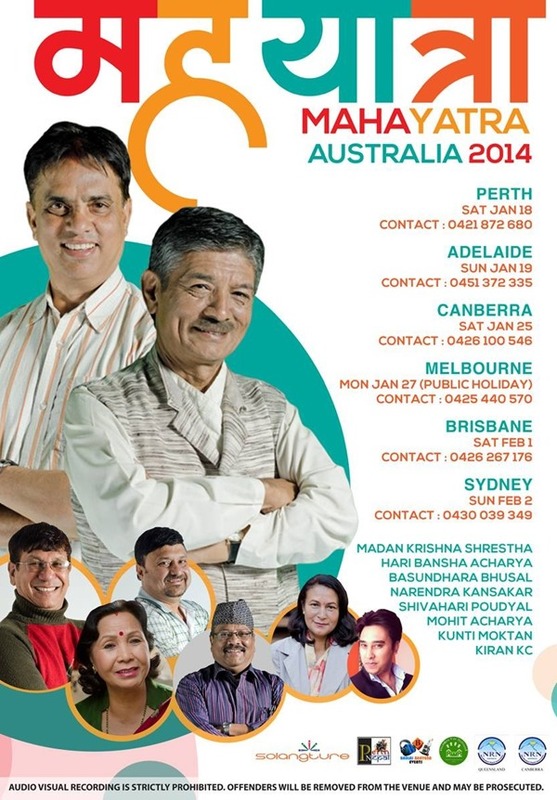 The MaHa duo, Madan Krishna Shrestha and Hari Bansha Acharya and other artists are going to perform in various cities of Australia under a tour titled MaHa Yatra 2014. The artists are scheduled to reach Australia on January 16. The tour will start from the Australian city Perth on January 18 and will conclude in Sydney on February 2. The events will be conducted in the major cities like Perth, Canberra, Melbourne, Brisbane, Adelaida, and Sydney. The show was going to be even better than we had imagined as there other artist who were supporting Maha on their amazing show. Straightaway I sent the link to all my friends and family so we could go together. And I bought the ticket as I didn’t want the tickets to run out. I was glad that I was able to save $15 a ticket in the process as well. That was back in December. Yesterday, February 2, Sunday was the much awaited date of the event. Many of you might me surprised that the event was in the evening from 6:30 -10pm. Yes, I was thinking the same thing, the pain of having to wake up early to go to work the next day after the show but I am sure Maha was worth that trouble. 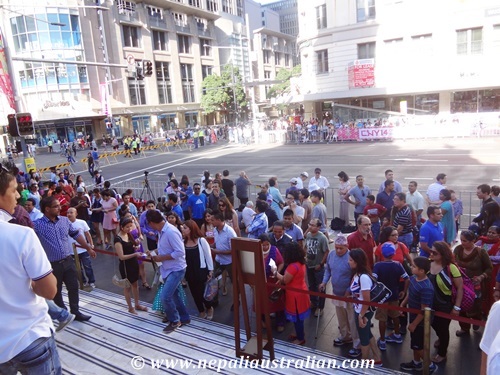 There were heaps of people who we knew attending the event and everyone was excited about it. The only downside of this event was that seats are unallocated that means first come, first serve for the best seats. I and AS decided that we wanted to get good seats so we planned on being at the venue at 5:00 pm to queue up as the doors were opening at 5.30pm. We had a very busy Sunday and both of us were tired in the afternoon. However, the excitement for the show kept both of us going. We caught a train and were at the venue around 5:00pm. To our dismay, all the other people had the same idea and there was a long queue in front of the venue. We saw lines going two directions and realised that the gates were not open yet. While we were in the queue, after around 15 minutes one of the organisers came shouting that the line we were on was for pre purchased tickets only and if we have bought the tickets online we need to be in the other. He was also saying that people with VIP platinum tickets could walk right in with no need to queue up! Ah the luxury of being a VIP! I was really annoyed after that as there were no sign saying that. Later I saw the signs close to the door where no one could see them. That was just ridiculous form their part as we were not the only people who were queuing in the wrong line. They could have made life easy for everyone if they had some big signs saying the same thing or some volunteers announcing it more often. Anyway, we had no choice but to change the line and go back to another long line. This is the kind of thing that normally puts off people to attend functions. Anyway I tried to calm down as I didn’t want to ruin our experience with Maha. I also got a bit annoyed that if you know the organiser, you don’t have to queue as I saw many people without VIP Platinum tickets been escorted up the stairs. I was thinking, I wish I knew someone too so I didn’t have to stand in the sun on the hot day. Good thing that the gate did open at 5:30 and the line slowly moved forward. Finally we were able to give our internet printout and were given two bracelets. It was going to be our tickets for the show. As we walked inside the venue it was a bit dark and someone was already on the stage. Glad the program introduction was already on, which meant the main event was going to start soon. As we had imagined, all the good seats were already taken but we still managed to get two seats with unobstructed view of the stage and this is how the evening started. There were two MCs on the stage, a male and a female, and they were reading the thank you notes to the sponsors and the rules against recording the show. I do understand that due to internet they have to be strict with recording devices these days and I had even watched announcement before the event and was aware of no photos and video rules. It was sad that I am not able to share any photos from the events but just my experience in these words. One rule that really surprised me was that we were not allowed to leave the venue once we are in. I wish they had told us that on our ticket so we could come prepared with some snacks. Then they started calling names of some well know Nepalese people in Sydney to come to the front of the hall as an honor and recognition for their contribution to Nepalese community. It may sound bad but sometimes I feel that most of the community in Sydney are there to promote themselves than the Nepalese people and culture. They always organise things and show off things in the events like this . A while ago I attended a Nepalese function where they spent the first one hour of the event describing what they did which I think was not impressive anyway and at the same time honoring each other for their contribution. I did not think even 5% of the audience cared about all that was being said as they were trying to bask in the 5 minutes of fame. But with this event I am glad they didn’t do the same thing but went straight to the program. The program started with local dancers doing contemporary moves by 2 boys and some Nepalese moves by 2 girls. The boys were good even thought they were not in sync all the time but the girls were not so good. They forgot their moves and steps so many times. While I was watching them perform, I was hoping there were not many local artists performing before the real acts. Sometimes I feel that they are forcing us to watch these acts even though we didn’t pay to see them. I know they want to show their talents but I am sure there are many other platforms where they will be much appreciated than shows like this where people feel forced to watch them. Thank god, the organisers were smart and to our surprise, it was the only local act for the whole event. Then the proper event started. The first one on the stage Shiva Hari Poudel, the funny man I remember form TV programs I used to watch as a kid back in Kathmandu. OMG, what a start of the amazing night we had. He was so funny that my tummy was already hurting by the time he left the stage. What an amazing talented entertainer who could do stand-up comedy, sing, parody and much much more. It was followed by the songs from a veteran Nepalese singer, Kunti Moktang. She is one of the classically trained folk and modern singers in Nepal and I learned that she was actually born in Darjeeling. 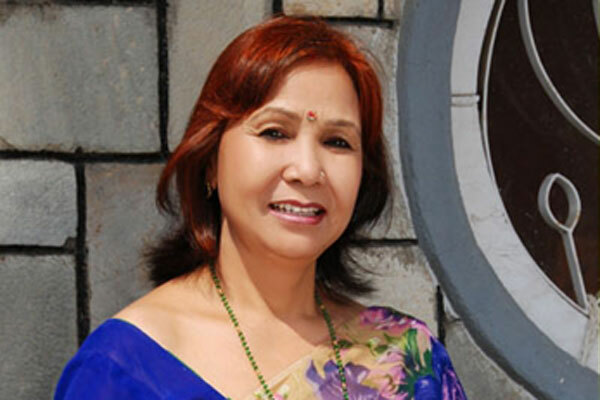 I never knew that about her but remember listening to her songs on radio and watching her on TV in Nepal. She was an amazing performer for sure as she engaged the crowd so well. The energy she has and the way her voice made connecting with the audience was just amazing. I loved every bit of per performance. It was followed by the singing dancing act by Kiran KC, another veteran comedian and actor who I remember from my days in Kathmandu. I was surprised that he is so multi-talented as he sang, danced and made everyone laugh as well. I was really enjoying the event and the best part was yet to come. Then it was the show time, the Maha duo were on stage along with Basundhara Bhusal (comic actresses in Nepalese movie Industry), and Mohit Bamsha Acharya. The show was just Amazing with a capital A. They tackled political topics with parody really well and added lots of fun. There was never a dull moment, no wonder they have been around for so long and are so well loved. This was my second time watching their live show. I remember the last one was equally spectacular. I had also gone to watch Hari Bansha Achary’s movie when he was here the last time and also met him in person. Amazing human being and so well grounded for someone with so much fame. After the main act, they went around again with Kunti Moktang’s songs, Kiran KC and Shiva Hari Poudel another comedy piece and to our surprise another act by the Maha duo which was equally funny and entertaining. We couldn’t believe we were treated with so much variety that this show definitely made the most amazing show in Sydney by any Nepalese artist. That was followed again by songs my Kunti Moktang. She was doing a great job and even Basundhara Bhusal, Shiva Hari Poudel and Kiran KC came on the stage to dance to her songs. It was 10.20pm when I checked my watch and we could not stand our tummy’s cry for food any longer. It was literally begging us at that stage. So when the last song for Kuntai Motaga was over, we thought the program must be nearly over and decided to leave and run to the nearby KFC to get some energy so we could survive our ride back home on the train. Of course KFC had to be busy as well and it took a while to order the dinner. I have never had KFC so tasty and good. (Mental notes to self, do more exercise to burn all that fat from chicken wings and the wrap). Once we were done with our dinner, we made our way to the station and saw many people on the platform returning from the show. The program seemed to be finished so I guess we didn’t miss much. We were home by 11.30 and in bed after midnight which is really late for a Sunday nite :(. But we enjoyed the show as we had never before. If you ever hear that the Maha duo is coming to your town with Maha Yatra, go and buy the best tickets you can and enjoy the show. I am 100% certain, it will be worth every penny and they will keep you entertained for sure. I hope to go to this kind of amazing shows in future in Sydney as well. Hope other organisers will take notice of this event and try to raise their benchmark of Nepalese programs in Sydney. Please no more local artists to bore us until we wait for the performance we paid our money for. 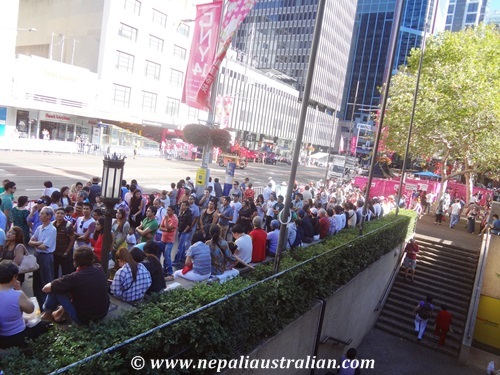 And no more Nepali time please, we are in Sydney, Australia. First of all, well done on organising one of the best organised event I ever attended in Sydney in more than a decade Definitely the artists and their performance was A class and I am sure everyone who has attended the show will agree with me. But there are some things I will like to point out that could have made our experience even better. Allocated seating so we don’t feel that we need to fight for the seats. Because of the same reason, I couldn’t have seats next to our friends and family. Sorry, that male MC was booed out of the staged every time he came. You know the reason why. We didn’t want him to be on stage for 10 minutes reading things out of a paper when we could have used that time to be entertained by the amazing artists. I hope that will be a lesson learned and it was well tackled as the program continued, well done. People need to remember you don’t need to scream on the microphone, they are already loud enough. It is a note for your female MC. She did a great job apart from the fact that she was screaming into the microphone while announcing the artists. As it was a dinner show, everyone would have benefited from a quick break. In addition, a note printed on a ticket that we were not allowed to go out from the venue and there would be no breaks would have been really appreciated. It was not fun to go for 5 hours without any food. My tummy was crying even thought I was having lots of fun. I know you guys were giving us great entertainment but still we do need FOOD. Town hall is an amazing venue but I noticed this time and last time too, they don’t have good absorption for noise so look into it a bit as there were high pitched problem few times and I missed a few dialogues (I am sure important too) as well during the events. Make the events Friday or Saturdays nights if possible as waking up this morning was a pain (everywhere). P.S: This post and this is merely sharing my true experience of the event and have no intention of offending anyone. This entry was posted in Australia, Nepal and tagged Basundhara Bhusal, Hari Bansha Acharya, Haribansha’s son, Kiran KC, Kunti Moktan, Madan Krishna Shrestha, MaHa, MaHa Yatra, Mohit Bamsha Acharya, Narendra Kansarkar, Shiva Hari Poudel, Sydney. Bookmark the permalink. sounds just like life in Nepal: maybe you could of bribed your way in! I have a lot of respect for them. They are the finest actors and motivators of Nepal. Thanks for this post. Nice post! Ha the Nepali time it seems applies for Nepalese anywhere in the world! Wish the Maha duo comes to New Zealand as well sometime. Thank you for liking my blog! Any thoughts? Come back and visit sometime! Glad to know that you enjoyed the show. And yes, those suggestions are worth appreciating . It was great nite :), loved it.